Interferometry (in this case “astronomical interferometry”) is a technique that astronomers use to obtain the resolution of a large telescope by using multiple smaller telescopes. The electromagnetic radiation collected at each of a number of separate small telescopes is combined to re-create the image that would have been obtained with the large telescope. A common term used for this process is “aperture synthesis” (i.e. making a large aperture from many smaller ones). As a telescope gets larger, it is possible to see increasingly more detail in the objects that are being looked at – this is referred to as obtaining higher resolution. However, making very large telescopes (for instance two or three football fields in diameter), is extremely complicated and expensive. How do you build an interferometer? Determining what resolution and brightness of targets you want to look at. This tells you how far apart (this addresses the resolution part of the question – called the baseline) and how large (this addresses the brightness part of the question – we call these the apertures) the individual telescopes have to be. From this, and how quickly you need to build up your images, you can determine how many telescopes you require and how to combine the light from them the most efficiently (the layout of the array). In the case of MROI, the telescopes are 1.4 meter diameter apertures which are movable and range from baselines of 7.8 meters out to baselines of 340 meters. 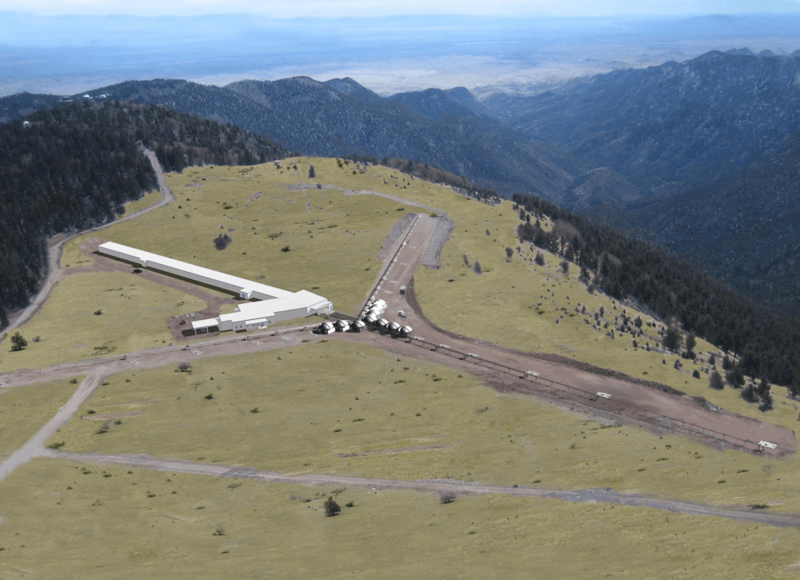 With the efficient combination of electromagnetic radiation in the interferometer beam combining facilities, objects as faint as 14th magnitude in the near-infrared can be studied. Depending upon the size of the individual telescope apertures, a correction has to be applied to the light that is coming from the celestial object and through the Earth’s atmosphere. The atmosphere is constantly moving and distorts the light, making it difficult to recreate a “perfect” image. 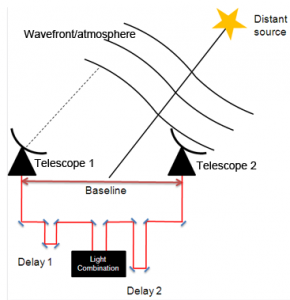 This light can be corrected using adaptive optics, the telescope apertures are well-matched to the natural behavior of the atmosphere above the telescopes on top of the mountain, and so only very simple adaptive optics (called tip and tilt) are required to correct most of the aberrations. Looking at objects as they move across the sky (because the Earth is rotating) allows astronomers to build up their images faster. This is because, from the perspective of the stars looking back toward the Earth, the interferometer array is rotating throughout the night. Because of this, though, there is another correction that must be applied to be able to track the stars as they move – this is called “adding delay”. The addition of delay allows the astronomer to recreate the image precisely as though a large telescope were being used to collect the light. At optical and infrared wavelengths, this delay is added using very precisely placed and carefully moving optics called delay lines. (At radio wavelengths, such as those used at NRAO, this is done in software.) MROI has unique delay lines used nowhere else in the world. You may also wish look at our Glossary of terms page.